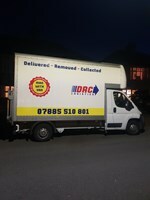 DRC Logistics - Removals/Storage based in Bexleyheath, Kent. Hi, we are a fully insured removal company that has been trading for 6 years. We have a lot of experience with our moves and we aim to treat ur stuff like it's our own. We are very careful we work with two of us, however if you require more people this can be arranged. We also offer a man and van service and same day deliveries or collections, have a look on our Facebook page! We are a sole trading company that receives nothing but positive feedback, we respect our customers and aim to do the best job we can possibly do for you.